Nick had been working in construction for about ten years. The last job he had was building a prison in Idaho. Some of his co-workers were themselves on probation and Nick could not help but consider that this prison or some similar complex could be the fate of these few. It was more than a little depressing. Nick said that the sentiment he would often hear among his peers was how great it would be to have a little farm. And so, he decided to give it a try. Nick spent his first year getting his hands dirty in Northern California on a 6-acre farm. 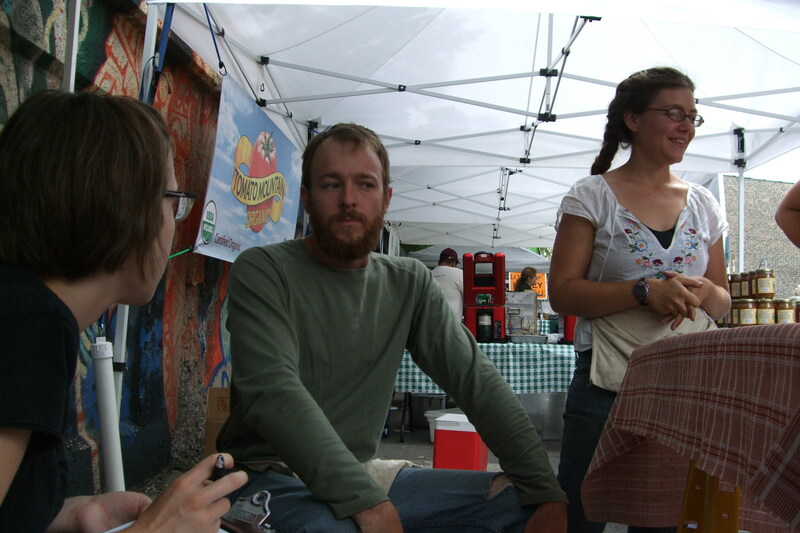 The following year he worked as a crew leader for Sandhill Organics, where he met Becky Stark. Becky was working with Nick at this market and helps out on the farm when she can, when not busy with her full-time job. For the most part, Nick is farming his two acres alone. He wonders how he might scale-up next year, what he might do for winter work, and how to make a living as an organic farmer. It is through the FBDC that Nick and other farmers are able to rent certified organic farmland at an affordable rate. The FBDC is an “incubator” program that provides land, a farming infrastructure and the proper learning conditions to help beginning farmers develop the skills they need and to secure the financing necessary to launch a farming business. They share necessary farming equipment, packing materials, greenhouse facilities and receive mentoring among the growing network of Prairie Crossing farmers. Farmers are expected to “graduate to the next level of independence” from the incubator after no more than five years. The program focuses on increasing the supply of locally grown food while offering an opportunity to those interested in farming organically– that otherwise do not have the capital necessary to begin on their own.